I don't know if I've mentioned it before, but I always cook way too much food. I grew up in a family of six, so I suppose that's what's stuck in my mind when I'm preparing our meals...cook for six. 1. Poor planning, lady. Why cook all that extra food when there's only two adults and a toddler to eat it? 2. Way to look ahead! All that extra food would be amazing as leftover lunches! I like to look at things with the #2 frame of mind. There's only one problem with that. My husband doesn't like hates it when I send him leftovers for lunch. Crazy, right? So that leaves me eating leftovers of the same thing two or three times when all is said and done. What does any of this have to do with a Pasta Frittata, you may ask? It all comes back to the pasta I cooked for dinner last week. I made a pound of pasta. (I just can't help myself from dumping that whole darn box into the water.) That meant leftover pasta for me. Twice. And there was still some left. By that time I was done with leftovers. I still didn't have the heart to throw it away, though! Waste not, want not, you know? It was then that I remembered this recipe that I cut out of a magazine years ago and never made. 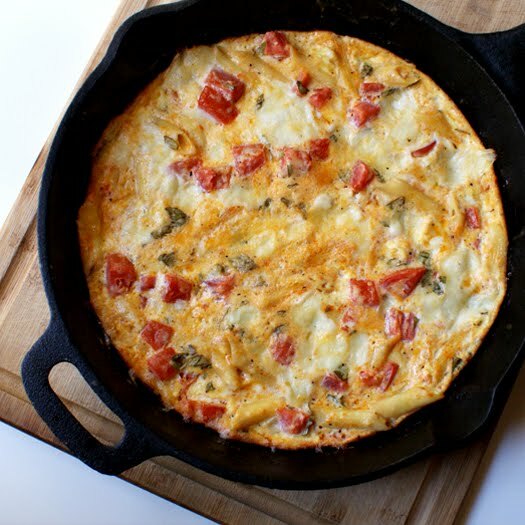 I dug it out of my file cabinet and turned that pasta into a frittata that was amazingly good! So, the next time you're making spaghetti for dinner, make a little extra and turn the leftovers into breakfast the next day! You won't be disappointed. 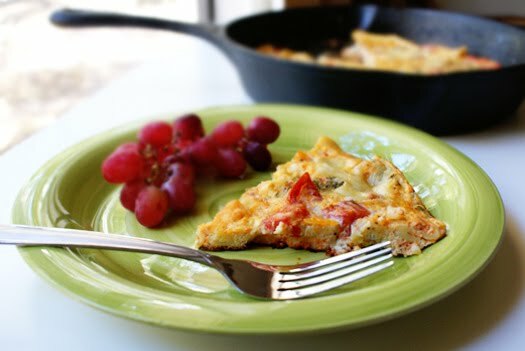 In a large bowl, beat the eggs then stir in the mozzarella, tomatoes, basil, and parmesan. Season with salt and pepper. In a large skillet (I used my cast iron), heat the olive oil over medium heat. Add the pasta to the pan and cook for a few minutes to heat it up. Add the egg mixture to the pan and cook it until the edges start to firm up (about 7 or 8 minutes). Take a wooden spoon and pull in the edges and let the liquid-y parts spill into the perimeter of the pan. Continue cooking until the eggs are almost set, but still a little runny in the center (about 4 more minutes). Move the pan to the oven and bake for about 10 more minutes. Let sit for 5 minutes before serving. Source: Adapted from a recipe in Everyday with Rachel Ray magazine.